Info "‘Get me over to that island! There are sharks in the water!’"
Safe or Snack is one of Tiny Wario's Microgames in WarioWare: Smooth Moves. 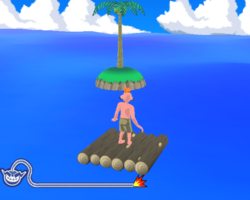 The player must guide the raft to small island by tilting the Wii Remote towards it. However, there are sharks in the water. If the player touches one, the character will drown and he or she will lose. 1st level difficulty: The water is devoid of danger. 2nd level difficulty: There is a shark. 3rd level difficulty: There are two sharks. This page was last edited on February 20, 2018, at 18:03.